Solo Guitar - playing mainly jazz standards, ballads and light background music for weddings, functions, events etc. These are mainly chord-melody performances, in something approaching the style of Joe Pass (though not so virtuosic!). Almost all the the arrangements have some improvisation in them. My YouTube clips have some examples. I love playing this style of music, it's warm, romantic and creative, perfect for restaurants and wedding receptions. Gordon Mark Webber's Road Runners - a 8-9 piece band playing dinner jazz, classic soul, disco and funk tunes from the 60s, 70s, 80s right through to the contemporary soul of today. The RRs play at all types of events and functions. For more information visit the Road Runners website: Gordon Mark Webber's Road Runners. I'm a massive fan of Stax Records guitarist Steve Cropper's rhythm playing, so if you catch me grinning while we're going at full throttle that'll be why! Bold's Band - an occasional Ceildh band for Barn Dances, Scottish, Irish, English, Celtic nights. Great fun, we generally play fundraising events, weddings, festivals. 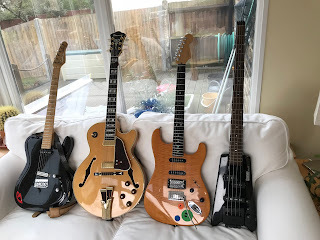 As a guitarist or bass player on these events I'm mostly in the pocket playing the changes, but I love to step up and play some of the tunes when I get the chance too. Some of those tunes are really tricky to play on guitar and its a great challenge to play the lead lines in unison with fiddle and melodian, mostly on guitar... but sometimes (to annoy my bandmates)... on banjo!